Going forward, the YMCA of the USA requires all teams to have a credit card on file to pay YMCA fees. 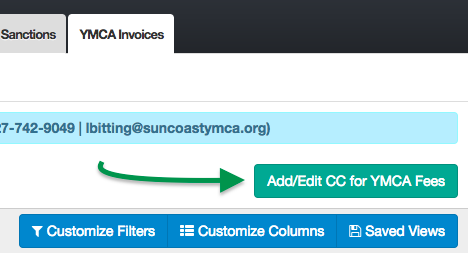 In the side menu click YMCA Admin > YMCA Invoices. Click Add/Edit CC for YMCA Fees. If you have a CC on file already, you will see the below screen. If you want to update it, click Update Card. 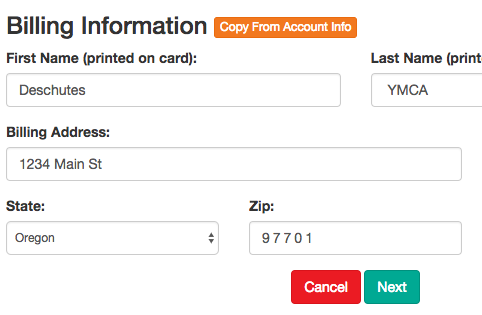 Enter your new or updated credit card data to be used to pay YMCA fees. You may click Copy From Account Info if your credit card data is the same as that in Team Admin > Team Setup. You will now see your CC listed as shown in step 3 above.